You have some old projects somewhere, or you are in love with the old school style of Visual C++ 6, but nowadays, Windows doesn’t like softwares of the last century. try to launch msdevP.exe or msdevS.exe with compatibility and administrator value for XP and Admin. Now it’s possible to work with VC6 on Windows 8.1. ! This entry was posted in Development on 24 November 2013 by Wavosaur. Ok, based on this blog I decided to try something. I was able to install VC6 on windows 8.1 but had the problem as described. After reading this solution, I simply renamed msdev.exe to msdevp.exe in the bin folder and it ran fine. Turns out you can rename it to anything and it will work fine. I tried to use procmon to see what could possibly explain this and failed. Anyone out there have any idea why renaming the exe will allow it to run? I assume there is some registry entry associated with msdev.exe that is loading some addin that is failing but I can’t figure out what or where it is. Can you explain in detail how you installed MSVC6 on 8.1 ? Like for example, from which installer. For me the installer aborts about 75% of the way thru and it says ‘MSVC was not installed properly’. IIRC I tried renaming the exe and it didn’t work but if u say it worked it’s possible that they are sabotaging it on purpose just to get rid of it. Also, THANK YOU to the original solution poster. Just renaming the msdev.exe didn’t work for me, i had to follow the same steps : download the sp6 pack, extract the files and copy to the msdev folder. i had to run msdevp.exe! Out of curiosity, did you try to rename msdevp.exe to msdev.exe? If so, does this run or abort? I tried to rename it and it aborted. this is what lead me to try just renaming the original msdev.exe to msdevp.exe. I’ve just tried this and it works fine. Note that you don’t need to copy over the VC++ SP6 files, just apply the SP as normal. The important thing to note is that you need to *rename* MSDEV.EXE to msdevp.exe, don’t copy it (i.e. leave a copy of MSDEV.EXE in the directory). MSDEV.EXE needs to vanish, and then msdevp.exe will run fine. As the OP notes, it looks like an appcompat bug that’s causing this. Install VC++ 6 as usual, but de-select “ADO, RDS and OLE DB Providers” (ignore the warning) or the install will hang at the end of the setup. After that msdevp.exe can be run as normal (no need for compatibility mode or anything else). So the only two tricks are to de-select ADO et al, and to rename MSDEV.EXE. Man is it good to get VC++ 6 back instead of the sluggish bloat of VS 2010. Thanks to everyone who’s contributed for the suggestions. It works for me!!!! I didn’t installed the VC6: I ‘ve just copied the installation files in a directory and copy the SP files inside. After I launched the msdevp.exe, and it worked!!! I think the problem just come from a start procedure in the msdev.exe becase the differences between the two exe is not very important. Thanks!! I renamed msdev.exe to msdevp.exe and it works. Yeah this video explains different way l.
Visual c++ 6.0 in windows 10. I launched the msdevp.exe, and it worked!!! I think the problem just come from a start procedure in the msdev.exe becase the differences between the two exe is not very important. I launched the msdevp.exe, and it worked!!! I think the problem just come from a start procedure in the msdev.exe because the differences between the two exe are not very important. 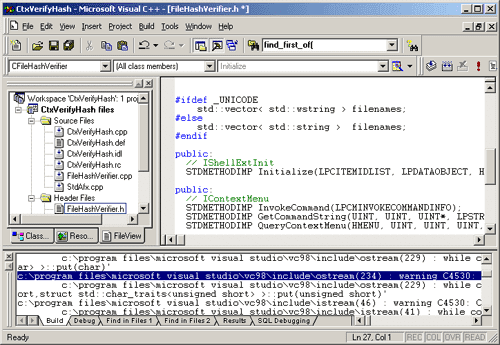 Open the %Program Files%\Microsoft Visual Studio\Common\MSDev98\Bin\ folder! And rename the MSDEV.EXE to MSDEV-S.exe, it can also be another name & your work is done.